From Audi and 84 Lumber's politically charged themes to Snickers live comedy, advertisers took risks hoping for a big payoff. Days before the Super Bowl, President Donald Trump, just two weeks into his first 100 days, boasted to the news media that he had become a bigger story than the game. The president is right on that one. He has. The game this year was more exciting than most, with viewers getting a remarkable turnaround story when the Patriots closed a 19-point lead in the final quarter. It was an extraordinary finish. But the president, or rather the anxiety he's unleashed since taking office, still stole the show. The usual Big Game ensemble showed up—babies, animals and celebrities—but the loudest voice to fill the game, of course, was President Trump. Unlike past years, when the reality show star swilled for advertisers on the small screen during advertising's biggest night, this year it was his policies and the effects his first explosively divisive two weeks in office have had on the mood of the nation that inspired much of the most memorable advertising of the night. Super Bowl content is always patriotic, of course. Despite growing global interest in the game, it is still a uniquely American sport. From the pregame show and sportscaster chatter to the $5 million per 30-second commercials and Lady Gaga, the political fervor roiling the nation and setting off protests around the globe charged the night. While most advertisers stayed out of the political fray, many jumped right in, some with more conviction than others. Coca-Cola, the quintessential American brand across the globe, decided to play it safe. The brand that in 1971, during the Vietnam War, gave Super Bowl viewers a bold musical message of peace and multicultural unity in "Hilltop," decided to run product-focused ads "proven to drive results," a senior brand manager at Coca-Cola said, on the game this year. The brand's most provocative message ran during the pregame, one of the most uplifting messages of the night, a rerun from Super Bowl 2014. In light of Trump's "America First" policy that closed the doors of our nation to seven Muslim-majority countries, the soft drink's reminder that America is a nation of immigrants is all the more poignant now. "It's beautiful" features Americans of diverse heritage, including the most maligned group, Muslims, singing "America The Beautiful" in their native languages, including Arabic and Hindi. Like last time, the spot inspired the hate in xenophobes, who criticized the brand for the heresy of celebrating America's most patriotic song in any other language than English. Now I give the brand points for running it again and opening itself up once more to consumer backlash, but the brand could have used its multimillion-dollar message on the game that included its hometown team Atlanta Falcons to take a stand and make a statement. Instead, the brand touted its Super Bowl showing, stories "proven to drive results for our business and illustrate the simple pleasure of drinking an ice-cold Coca-Cola." Even with recycled creative, it seemed like a missed opportunity to make a "Hilltop"-worthy redux. Yet there were plenty of brands that didn't hesitate to take dangerous leaps. The five best ads of the game took the greatest risks. 84 Lumber "The Journey Begins"
While many Super Bowl advertisers had themes of inclusion and acceptance, from brands including Turkish Airlines, Airbnb, Expedia and the NFL, the most provocative position came from first time Super Bowl advertiser 84 Lumber, a building materials company that turned talk about Trump's border wall into the most-discussed spot on the game with the story of a Mexican family traveling to America for work. The ad follows the arduous journey of a mother and her daughter as they make their way from their village—through harsh terrain, on foot and on the back of a pick up truck—to pursue the American dream. But the concept, which has them finding their entrance to America blocked by a giant border wall, was deemed "too controversial" for prime time broadcast. Instead, the company ran the tale's conclusion online only—they find a door, an entrance to the country, that has been built by 84 Lumber workers. The message, "the will to succeed is always welcome here." While the "controversy" was likely planned to maximize the publicity around the buy, the cinematic long-form tear-jerker put the never-before-heard-of brand smack in the center of the most heated political conversation this year. As marches about the immigration travel ban spread across the globe the week of the game, one brave car manufacturer dared to spread one of the many calls to action shouted during the biggest protest in American history, the women's marches that took place all over the nation the day after the inauguration. While brands like Coca-Cola and 84 Lumber reminded Americans that we are a nation of immigrants, Audi touted its commitment to gender equality with a story of a father watching his daughter compete in a soapbox derby and wondering whether she will get equal pay for equal work. "Progress is for everyone," concluded the ad. America did not get its first female president, but Audi was courageous enough to keep the gender equality conversation front and center with a risky statement that invited critics to question whether the brand practice what it preaches. Detractors flooded social media with accusations of hypocrisy since no women sit on the company's management board and only two are on the US executive team. Another beautiful American immigration story, this one coming straight from the history of the brand. While Anhueser-Busch is no longer a US-owned company, the beer giant celebrated its American birth with the story of the US arrival of its founder Adolphus Busch. Another powerful reminder that America was founded on the hard work of immigrants, it was also a powerful reminder that the discrimination and prejudice faced by today's unwelcomed immigrants is not new to newcomers to these shores. He's taunted with the kind of messages of hate that's become all too familiar. "You're not wanted here!" and "Go back home!" Even though the brewer said the ad wasn't intended to be political—and maybe any other year the ad wouldn't be so controversial—its willingness to step into a political minefield is admirable. 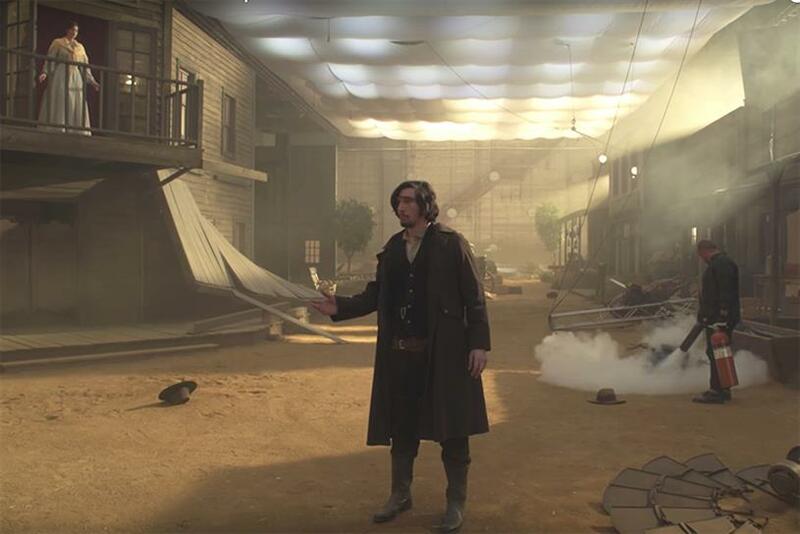 Snickers "A Live Super Bowl Commercial"
The Mars brand didn't take chances with a politically themed message, but took a huge leap of faith in the flawless creative and production skills of its agency, producing a live commercial with "Star Wars" and "Girls" star Adam Driver. It was an unproven live execution of a Wild West scenario that stuck to a proven theme: chaos ensures when hunger strikes. Although the viewers are in on the gag—"you ruin Super Bowl commercials when you're hungry"—the scripted drama of watching Driver seemingly miss his cues and cause chaos on the live set was flawlessly executed and a risky evolution of its long-running strategy. Sometimes the gutsiest play is to stick to the tried and true. Even in the most politically charged of times, the Big Game needed comic relief and there was plenty to enjoy. Kristen Schaal as masochist Verizon customer for T-Mobile was one of the most surprising celebrity turns of the game this year, but the pure simplicity of this commercial won the night. A charming celebration of the product in classic bizarre "Taste the Rainbow" style, the candy managed to surprise while staying squarely on strategy with a story of a love-sick teen who uses the candy to get the late night attention of the object of his affection's entire family, and more.